The Cincinnati Zoo has always had a reputation as a cutting edge institution - from the first naturalistic animal environments in the world built at the Cincinnati Zoo in the 1930’s by naturalist Carl Hagenbeck, to its current designation as the ‘Greenest Zoo in America.’ In the 1950’s and ‘60’s, Carl A. Strauss and Associates left its mark on the zoo by adding a modern and more accessible touch. 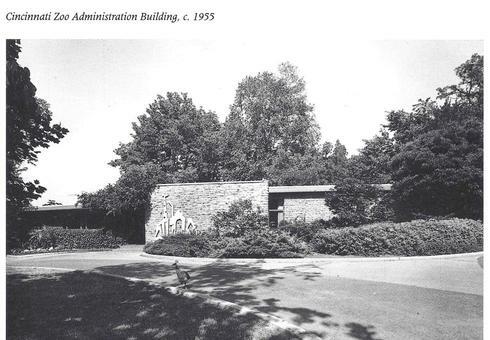 Join us and our special guest host, Cincinnati Zoo Director Thane Maynard as we tour his office in the 1955 Carl Strauss Administration building. Thane will also show us the newly renovated 1875 Reptile House, the oldest zoo building in the country. Our short program and reception will last from 10:00 a.m. until approximately noon. After that, feel free to enjoy the zoo on your own for the day. Thane has generously offered cf3 members a reduced zoo entrance admission of $10 per person (which includes parking)! If you are already a zoo member, then the event is free! Meet outside the main entrance of the zoo by 9:45 to purchase your $10 ticket from a designated cf3 member (cash only). These special discount tickets are available to the first 30 people to Rsvp. Please note on your response if you will need tickets so we can keep an accurate count.